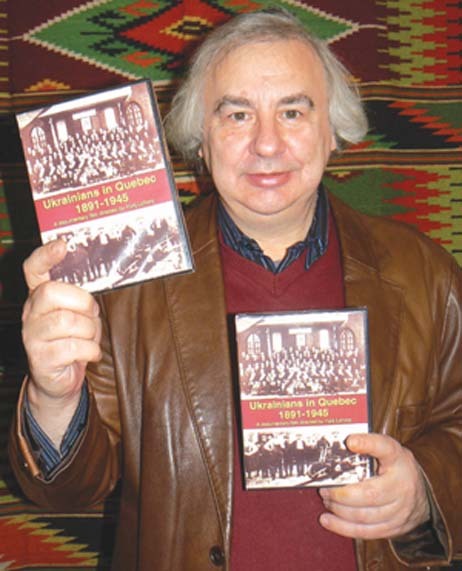 The English-language documentary Ukrainians in Quebec, first released in 16 mm, has now been re-mastered and just released on DVD in celebration of the 120th anniversary of Ukrainians in Canada (1891-2011). Produced, directed and edited by Yurij Luhovy, it tells the story of Ukrainian settlement in Quebec from 1891 to 1945. By means of rare, salvaged photographs and personal accounts, the 28 min. film depicts the formative years of the first two waves of Ukrainian immigration in Quebec: those who arrived before the First World War and those who came in the inter-war period. Ukrainians in Quebec was originally released in 1979 following four years of research, interviews and filming. It captures aspects of the cultural, organizational, religious and political development of the Ukrainian community in Montreal, as well as in Val d’Or, Rouyn Noranda and surrounding areas in Northern Quebec where many of the descendents of the original settlers still live. Rich in still photographs and vintage film footage, the documentary also recalls the establishment of the Sheptytsky Colony at Lac Castagnier in the Abitibi Region and is a lasting tribute to those early immigrant community builders no longer with us. Interviews with French-Canadian eye-witnesses describe daily life at Spirit Lake Internment Camp. Footage shot of the original internment prison barracks still standing at the time is also shown. This documentary was the first film to expose the unjust internment of Ukrainians during WWI and place the Spirit Lake internment in a wider context of early immigration to Quebec. Ongoing screening of the documentary will be a permanent part of the Spirit Lake Internment Interpretive Centre to open in 2011. Restoration of Ukrainians in Quebec was enabled in part with the financial support of the Shevchenko Foundation and the Camp Spirit Lake Corporation. The original version was partially supported by the Department of Multiculturalism, Secretary of State of Canada. This was the first documentary made by filmmaker Yurij Luhovy who had just graduated from film studies at Sir George Williams University (now Concordia). It began his journey in documenting aspects of Ukrainian and Ukrainian-Canadian history so that knowledge of the past always remains a part of our present and future. The Montreal Premiere of the documentary will be held in January 2011. Yurij Luhovy, MML Inc, 2330 Beaconsfield Ave., Montreal, Quebec, H4A 2G8; e-mail mmlinc@hotmail.com; tel. (514) 481 5871 or visit www.yluhovy.com.